Allow animals to settle before they are due to be moved. Avoid excitement during herding - when stressed, animals bunch together and handling becomes chaotic. Drive pigs in small groups. Correct uses of lighting in the driving alley - shadows in the chute are perceived as obstacles and cause the animals to baulk. Floors should be well designed and maintained, with no distractions, holes, or abrupt changes in floor type, sound or slope. Minimize the length of races, and avoid shunting up and down the race. This video shows unloading of pigs at an abattoir in Australia. Observe the obstacles impeding pigs in the driving area. Video: Sophie Atkinson. Jamming of pigs at the junction of a single-file chute entrance and the crowding pen is a common problem. The double chute (twin single-file chutes, side by side) facilitates loading compared to the single-file method because pigs have a choice of two entrances and jamming is reduced. When the double chute has solid outer walls and a "see-through" middle partition between the chutes, it promotes the pigs' natural following behaviour. This avoids the problems of driving pigs in single file. This photograph shows the importance of light. The right-hand line attracts the pigs because it is more brightly lit than in the left-hand line. By installing indirect light in the chute on the left, jamming was reduced. Photo: Temple Grandin. Race designs that prevent animals getting under or over one another as they move can reduce skin damage and bruising of the loins. 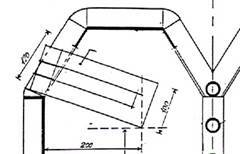 The profile developed by Temple Grandin (TG-profile) is equipped with solid outer walls to block outside distractions and a mid-section that pigs can see through. Dimensions should be adjusted to pig size. This drawing shows the race design developed by Temple Grandin. Drawing: DMRI. Ramps leading to the stunning machine should have a maximum slope of 10-15º. Many chutes with slopes have installed equipment that keeps the animals from baulking (e.g. stop-wings). 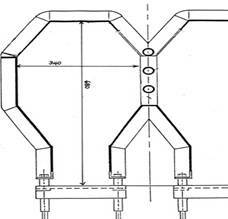 This drawing shows the stop-wing used in some of the races based on the Temple Grandin profile. Drawing: DMRI.